Cone crusher is the world's more advanced crushing equipment, is aggregate processing production line essential equipment. Zhengzhou Yifan Machinery Co., Ltd. currently produces four series of mainstream cone crusher: SDY Simmons series, SMG Hydraulic Cone Crusher, SMH Hydraulic Cone Crusher, SMS Hydraulic Cone Crusher has become one of the world popular crushing equipment. large crushing ratio, high production efficiency: The higher speed and stroke combined with the HP crusher rated power and greatly improved through improved crushing ratio and production efficiency. Hydraulic cone crusher wear parts consumption, low running costs: the result is reasonable, advanced crushing principle and technical parameters, reliable operation, low operating cost; crusher wear protection for all components are generally life can be increased more than 30%. Applied to large stones factory, the solution of the back-breaking average crushing ratio is small, energy consumption, hammer, impact plate, lining wear faster shortcomings. laminated crushing, better finished product shape: through the use of design principles intergranular special laminated crushing chamber and matching speed, instead of the traditional single particle crushing principle, to achieve selective crushing of materials, significantly increased the proportion of fine material products and cube content, greatly reducing the degree of flakiness materials. the hydraulic protection and hydraulic cavity clearing, high degree of automation, reduced downtime: Hydraulic regulating discharge opening and operation of the crusher overload protection level has been greatly improved, and make maintenance easier, more convenient, less downtime, HP series cone crushers way through iron release hydraulic cylinders allow iron through the crushing chamber, the aircraft in the event of over-iron and instantaneous stuffy car circumstances, can the chamber, automatic nesting, greatly reducing the need to cone crusher stop artificial nesting troubles, and many other manufacturers of crushers but it will shut down due to excessive iron death card. rare lubrication, reliable and advanced technology, improve service life: a unique lubrication system designed to improve the life of equipment. High performance non-contact labyrinth seals wear, improves the reliability of blocking dust, virtually eliminating the original cone crusher machine oil mixed with water and other common faults. hydraulic cone crusher crushing chamber with a variety of type, application flexibility, adaptability: HP cone crusher simply replace the fixed cone liner, moving cone liner, crushing cavity shape from standard coarse cavity to short head fine cavity arbitrary transform, adapt to a wide range of product size requirement. 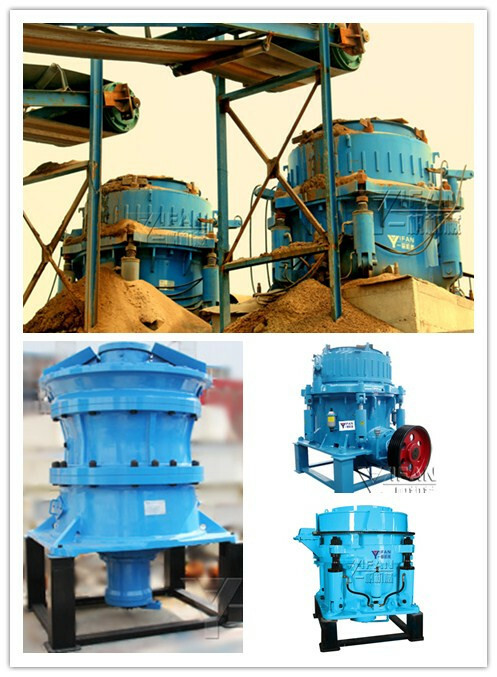 easy maintenance, easy operation: HP cone crusher All parts are available from the top or side disassembly and maintenance, moving cone and fixed cone easy disassembly without dismantling the rack, tighten bolts, thus breaking the routine replacement HP cone liner is more convenient. The use of hydraulic motors, the crusher production efficiency best.